NOTD: Mermaid Nails - Cherry Colors - Cosmetics Heaven! 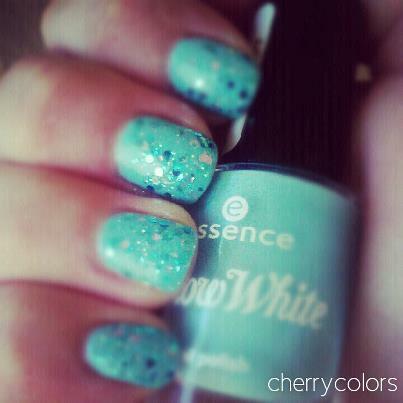 When I picked up the Snow White collection from Essence, I couldn't say NO to this beautiful topper (Glorious Aquarius). I don't think I saw it before that day. And because of it I also picked Sleepy from the Snow White TE. I decided to combine both of them to make a glittery combination. Glittery perfection - Mermaid nails! I used two coats of Essence Sleepy (which does dry extremely quickly, so it got kind of thick during the application) and one coat of Essence Glorious Aquarius. I really like the combination, but next time I'll try with a darker nail polish. The glitter polish is full of hexagonal glitter which is blue and some of them are also clear/going from clear to holo + it contains some micro glitter of the same type (plastic? ).